Ships of all shapes and sizes visit Anguilla daily. Drop by Road Bay in Anguilla Sandy Ground, and you will see a variety of super yachts, sail boats and old fishing boats. Some dock in the harbor permanently, and others just pass through on their way up to the BVIs, or down to Grenada. The Anguilla Sailing Association's instructor Lisa, who replaced William, was chatting about it. My friends were speculating on its origins. And of course, all of the children at the sailing school were curious. It was on a quiet Saturday afternoon... the Starfish had come and gone... just a few of us remained, hanging out, enjoying the calm day, when Lisa told us about an offer to take a tour in exchange for fishing bait! Without hesitation, we rounded up some dead squid, and with a few sailing students, we rode off for a closer look. Approaching The Haunting Pirate Ship, Aaargh! 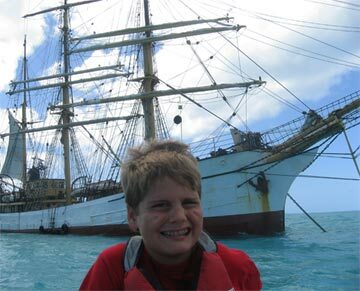 A friendly crew member, Kolin, helped us up from our dinghy, "Welcome aboard the Picton Castle!" That name sure sounded familiar... but the thought soon left my mind, and we proceeded to introduce ourselves. Kolin (from Alberta, Canada) left our care in the hands of the warm and welcoming Gunner from Texas. The Picton Castle didn't always have three masts and sails. When she was built in 1928, working in Wales (named after the Picton Castle in Wales), she was a fishing trawler. Her next position? A minesweeper during World War Two, a part of the Royal Navy, working in Norwegian waters, until she was abandoned there due to problems that she developed. Until 1996, she was in the North Sea and the Baltic Sea, just doing freight work. It was Captain Daniel Moreland who gave her another life, bringing her to a new home in the 90s. 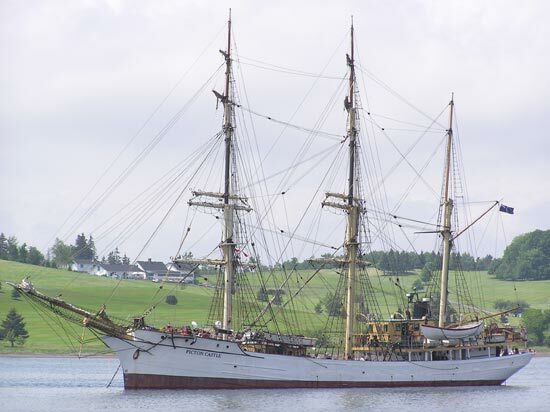 In Lunenberg, Nova Scotia, she was remodeled, going from a steam ship, to a "square-rigged barque". That's when it hit me! Lunenberg, Nova Scotia. Ah, yes. Our family has been traveling to our favorite east coast province nearly as long as we've been visiting Anguilla. My Dad owns land on "Hirtle's Beach" in Nova Scotia. That particular coast line faces due south, on the same line of longitude as Shoal Bay, coincidentally. With that settled, Gunner commenced the tour! He shared the ship's history, but what was it that she did now? Currently, she is a teaching ship. 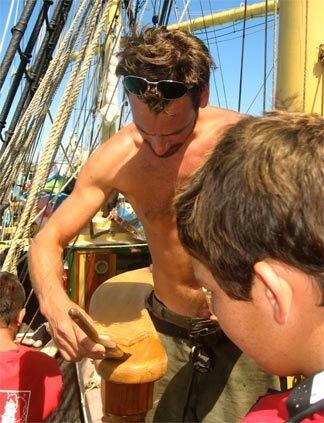 Students willing to enter an intensive sailing program, pay a fee and work on the Picton Castle for a few weeks, months, or even an entire year. The ship's voyages are composed of a number of "legs". We caught them during their "Voyage of the Atlantic World". Leg 1 was from Nova Scotia to Bergen, Norway traveling through Ireland, Falmouth, Denmark and Sweden. Gunner joined in Leg 2, going from Norway to the Netherlands, Germany, UK, France, down to Mallorca, Spain. From there (leg 3) they visited Morocco, the Canary Islands, Senegal, Cape Verde, before going to Brazil and Grenada. Anguilla was one of their last stops, before heading her back to Canada. Gunner mentioned that with a twinge of sadness. He was not looking forward to going home. So what do the students do? 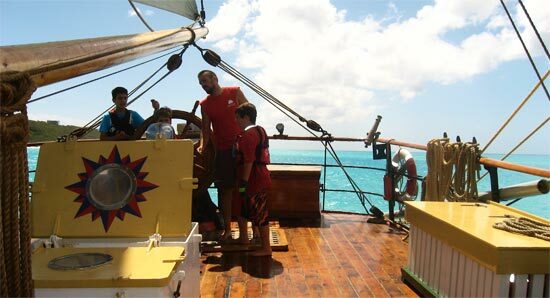 While aboard the 179 foot ship, you must learn 175 different lines for the 12,500 square feet of sail. In addition you must peform a number of duties, any of which can be assigned to you: cooking, cleaning, repairing sails, standing watch, steering the boat and so on. Gunner explained how they work four hours on, eight hours off. 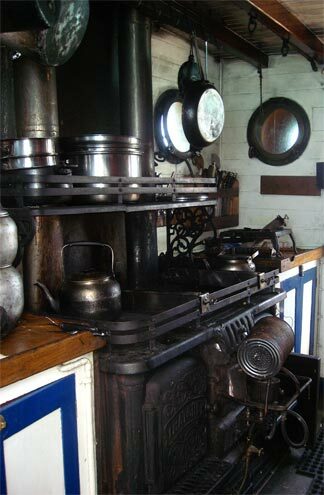 His four hours was mainly composed of lighting the stove, washing the deck, and tightening halyards. Any prerequisites? Only if you are working in more demanding areas on the ship are degrees and experience necessary. But, to be a crew member? Virtually, nothing, you learn along the way. "I was a farmer in South Texas, before this," he said. As the tour continued, I had to ask Gunner if he was the least bit scared, tossing his bags onto the ship at the start... I know I would be most hesitant! His response was genuine... No doubt about it, he was nervous. 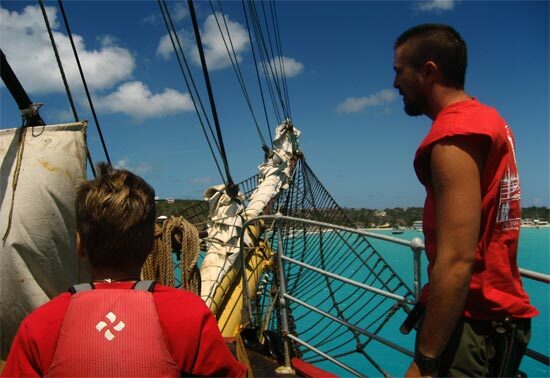 Spending a year on a ship, bouncing around rough seas, living with total strangers... It was a little daunting, but one of his best life experiences. One of the most challenging, I imagine too! Gunner told us about the choppy waters (a true understatement!) 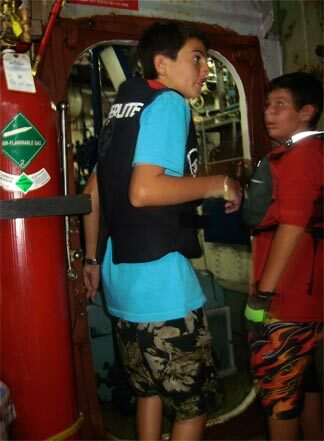 off the coast of West Africa when they were unable to come up from their bunks for two days. The Picton Castle lost Canadian hockey player Bob Gainey's daughter in such weather. Sadly, December 2006, off of Cape Cod, Laura Gainey was swept over, not wearing a life jacket, she was never found. 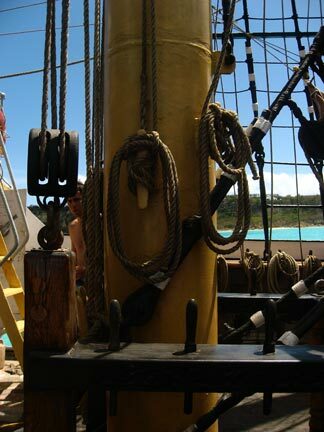 He assured us that while the Picton Castle has an antique shell, with fine wooden carvings, ornate railings, and a hodge-podge of creations and exotic pieces picked up from different destinations, their safety equipment is top of the line. With the tour winding down, we emerged from the hold, and headed back to our dinghy. Lisa was calling us back to the sailing school, and we had already taken up too much of Gunner's time. We thanked him gratefully for the fascinating tour, handed over the squid, and sunk back onto our blow-up dinghy. We parted from the ominous pirate-esque ship, waving good-bye to the pirate-esque crew. I may never have the guts or courage to embark on such an adventure, but it was inspiring! What an experience that would be. Some stimulating ships visit Anguilla, that's for sure!